So what is it about the winter months that sour our mood? From the cold weather, endless cloudy days, and long nights, simply surviving the long, dark is all millions of people can do. Among those with seasonal depression, 5% show symptoms of SAD, or Seasonal Affective Disorder, a condition brought on by the turn of the autumn and winter seasons. Sensitive to the changing calendar and clock, very little is still understood about SAD but doctors and scientists are starting to put the pieces together. Research has shown that SAD and symptoms therein may have something to do with the way our body accesses, processes, and interacts with light. Light, sunlight in particular, is the source of all life on earth, illuminating our environments and even guiding us spiritually. An important source for vitamin D, the sun’s rays contain powerful effects that greatly diminish during the winter months. During this time, living 37 degrees from the equator makes it almost impossible to get enough recommended vitamin D from sunlight, prompting experts to suggest daily supplements. Vitamin D, the sunshine vitamin, affects our bone growth, immune function, and helps with absorption of other minerals; vitamin D is so essential to the human body that vitamin D receptors can be found in nearly every cell of the body. Deficiency in this nutrient can cause fatigue, frequent colds, and feelings of depression - all similar symptoms of SAD. Though clearly nutritional factors play a part in Seasonal Affective Disorder, it's not the only variable. With sunlight comes day and night cycles, patterns of which help keep our internal clock, or circadian rhythms, healthy. Intrinsically Photosensitive Retinal Ganglion Cells, or its convenient acronym ipRGCs, are responsible for regulating our circadian rhythms in addition to pupil reflexes and even energy levels. Though ipRGCs do not trigger image-forming effects, they instead respond to environmental light as a process to maintain balance and health in the body. During winter, the earth’s orbit around the sun changes and leaves us with fewer hours of daylight and much longer nights and can be potentially disruptive for circadian rhythms. In those who suffer from SAD, restless nights may give way to fatigued days and chronic lack of sleep comes with its own complications. One of the only treatments proven to manage symptoms of Seasonal Affective Disorder is known as bright light therapy and makes use of various hues, brightness, and tones to replicate the light patterns of a comfortable, balmy day. A study in 2018 was conducted in which participants spent 30 minutes in the early morning wearing blue light goggles; In this study, participants reported reduced sleepiness even well into the day. However, blue light on its own isn’t a solution and as daylight hours dwindle in a 24-hour period, natural warm light replaces natural cool light. The winter blues have touched all of us at some point, but when looking forward to spring isn’t enough to curb the negativity, technology steps in to make up the difference. 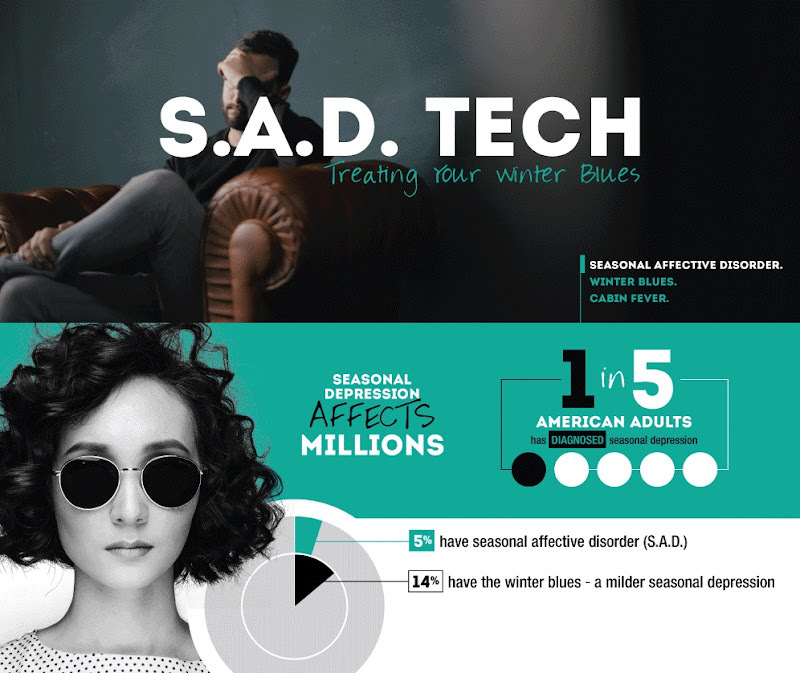 Learn more about SAD tech from this infographic!